The life of the painter Brancaleone Cugusi da Romana (Roman 1903 – Milan 1942) seen through the eyes of his child nephew who loved his uncle for his genius and recklessness that upset the existence of the bourgeois family. An intimate portrait, rebuilt not only through the personal memories, but especially from the private documentation collected in the course of a lifetime. 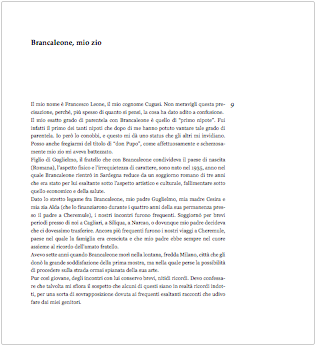 The book “Brancaleone mio zio” is downloadable in PDF 8€. Click to buy.